To celebrate 40th anniversary of Chez Panisse, Alice Water's quintessential farm-to-fork restaurant, Levi Strauss is launching a limited-edition T-shirt collection to benefit the Edible Schoolyard, a nonprofit Waters founded to integrate garden and kitchen education into grade-school curriculum. Designed by a celeb-studded roster of talents, including filmmaker Sofia Coppola, author Dave Eggers, musician David Byrne, and the grande dame of the slow-food movement herself, the shirts are printed on 100 percent organic cotton and embellished with hang-tags embedded with organic seeds. For a limited time, the five unisex tees will be available at select Levi’s stores and online at Levis.com. All proceeds will go to the Edible Schoolyard to promote food education in Berkeley and beyond. If you’re still hankering for more, pop by one of the host of festivities that will be ringing in Chez Panisse’s fourth decade. A design by Alice Waters, chef, owner of Chez Panisse, slow-food advocate, and founder of the Edible Schoolyard. T-shirt by author, editor, and McSweeney's spublisher Dave Eggers. 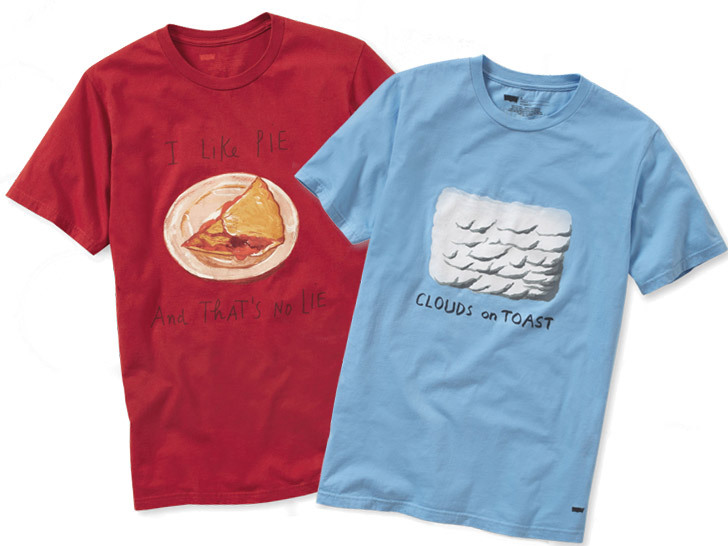 "Clouds on Toast" by musician David Byrne, founding member and principal songwriter of the band Talking Heads. Our new favorite mantra, courtesy of Maira Kalman, illustrator, author, and "visual columnist" for the New York Times. An understated design by filmmaker and director Sofia Coppola. 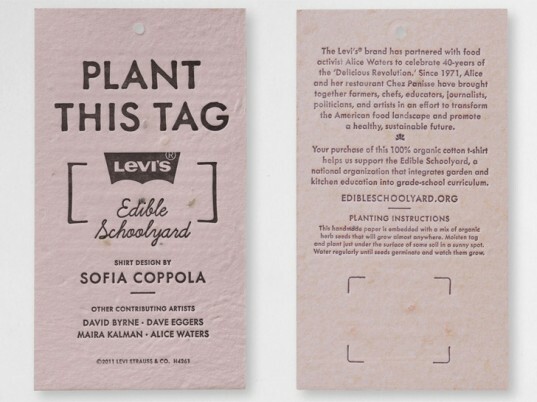 A letterpressed hang-tag, derived from handmade paper and embedded with organic seeds.